Note: Support for Internet connections using dial-up modems has been withdrawn. For more information, contact your Smoothwall representative. “Interface” can refer to both a software interface, such as a virtual LAN, and a physical network interface card (NIC). Within the Smoothwall, “interface” typically refers to a software interface, whereas NICs have “roles”. External interfaces connect your network to the Internet. For a detailed description of how to configure an external role, see Creating an External Connection . Typically, basic interfaces deal with internal network traffic. During installation, a basic interface is reserved, and configured to provide a direct link to the Smoothwall, either through the administration user interface, or through secure shell (SSH). For a detailed description of how to add an IP address to a basic interface, see Allocating IP Addresses to Interfaces . A bond member is one of two or more NICs combined together to provide high availability. A Bonding interface acts as the combination. For a detailed description of how to configure a bond member, see Configuring Bonded Interfaces. A bridge member is one of two or more NICs that bridge separate network zones together. A Bridge interface acts as the connection between NICs. For a detailed description of how to configure a bridge member, see Configuring Transparent Bridges. Within high availability, or failover configurations, heartbeat interfaces poll each other to ensure the failover system is functioning. Note that a Unified Threat Management serial is required to make use of a heartbeat interface. For more information, refer to your Smoothwall representative. For a detailed description of how to configure a heartbeat interface, see Managing Hardware Failover . A Bonding interface is a software interface that combines NICs to provide high availability. For a detailed description of how to configure a bonded interface, see Configuring Bonded Interfaces. A virtual local area network (VLAN) is a virtual network zone. VLAN interfaces are software interfaces, associated with a NIC. For a detailed description of how to configure a VLAN interface, see Using Virtual Local Area Networks . A Bridge interface is a software interface that links network zones, that is, NICs, together. For a detailed description of how to configure a bridge interface, see Configuring Transparent Bridges. A Point-to-Point Protocol over Ethernet (PPPoE) interface connects network zones using modems, or similar devices. For a detailed description of how to configure a PPPoE interface, see Using a Point-to-Point Protocol over Ethernet Interface . New NICs added to your appliance are automatically added to the configuration as a BASIC interface. You must configure additional interfaces for Internet connections, connections from internal clients for web filtering purposes, and so on. Note: The configuration entered for the NIC during the installation is to allow access to the Smoothwall from the administration user interface. For more information, see Using the Quick Installation Method or Using the Advanced Installation Method. Internet connections are made through the NIC configured as External. You can choose to configure this with a static IP address, or with one set by your ISP’s DHCP server. Note: “External connection” does not refer to those connections that use a PPPoE interface. For a detailed description of how to configure a PPPoE connection, see Using a Point-to-Point Protocol over Ethernet Interface . 1. Go to Network > Configuration > Interfaces. 2. Highlight the relevant interface, and click Edit. • Use as — Select External. • Spoof MAC — If MAC address spoofing is required, enter the new MAC address here. • MTU — If required, you can set the Maximum Transmission Unit (MTU) size, in bytes, for packets using this connection. • Comment — Configure an optional comment for this external interface. An additional button, Show comments, appears on the Ethernet interfaces table if any comments are configured. Clicking this displays configured comments under the interface name. You must assign the IP address, and gateway if provided, as advised by your ISP. This can either be a static IP address or one assigned dynamically. For a detailed description of how to do this, see Allocating IP Addresses to Interfaces . Note: IPv6 is not yet supported. For more information, refer to your Smoothwall representative. 2. From the Ethernet interfaces table, highlight the relevant external interface, and click Edit. 3. Edit the configuration as required. For a detailed description of each setting, see Creating an External Connection . You cannot delete an external connection as this is typically a port on the appliance. To remove an external interface, you delete the IP addresses allocated to the interface. For a detailed description of how to do this, see Deleting Allocated IP Addresses. If multiple external connections are configured on the appliance, the Smoothwall balances external-destined traffic, according to weighting, across all functioning connections. This way, a failed connection should not have any noticeable impact on network clients. For a detailed description of how to configure link load balancing weighting, see Load Balancing Traffic . 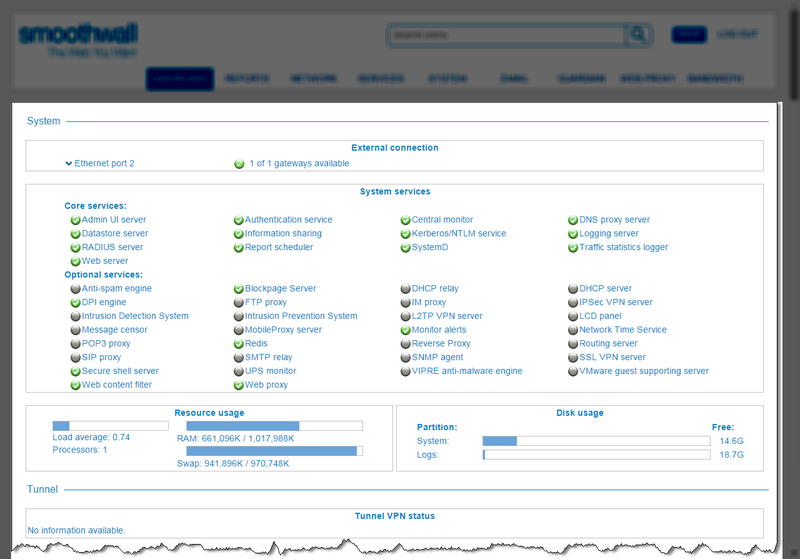 You can monitor the status of all external connections configured on your appliance, using the Smoothwall’s Dashboard.  From the menu list, go to Dashboard. For more information about the Dashboard, see About the Dashboard . Typically, you assign an IP address to the interface during installation (see Using the Quick Installation Method or Using the Advanced Installation Method).  Extra static IP address, for later use.  An IP address, set by DHCP, to an interface with a static IP address already assigned.  An IP address alias to a PPPoE interface. For a detailed description of how to add an IP address alias to a PPPoE interface, see Adding Alias IP Addresses. 2. Click the IP addresses link for the relevant interface to display the Attached addresses table. 3. Click Add new IP address. • Status — New IP addresses are enabled by default. Clear the check box to create a disabled IP address. • Type — Choose whether this IP address is assigned a static IP address (Static IPv4), or an IP address assigned via DHCP (DHCP IPv4). Enter the additional IP address for this interface. If traffic from this IP address needs to go through a gateway, select User defined, and either enter it into the box provided, or choose it from the drop-down list. This parameter is only displayed if a User defined Gateway is configured. If multiple gateways are configured and used, enter the minimum bandwidth used to load balance traffic between connections. If a single gateway is configured, load balancing is not used so this parameter can be left at 1. Select whether the configured value is in kilobits per second (kbps), or in megabits per second (Mbps). Connection monitoring is enabled by default. It is not recommended you disable connection monitoring, otherwise the Smoothwall assumes the gateway always has an internet connection. Optionally, enter the DHCP client hostname as specified by the DHCP server. • Comment — Configure an optional comment for this IP address. An additional button, Show comments, appears on the Attached addresses table if any comments are configured. Clicking this displays configured comments under the IP address. 2. From the Ethernet interfaces table, highlight the interface, and click IP addresses. 3. From the Attached addresses table, highlight the relevant IP address and click Edit. 4. Edit the configuration as required. For a detailed description of each setting, see Using Virtual Local Area Networks . Note: You cannot delete IP addresses that are assigned elsewhere, for example, used as part of a port forwarding rule (see Managing Inbound Traffic with Port Forwards) or source NAT policy (see Using Source NATs and LLB Policies ). 3. From the Attached addresses table, locate and highlight the relevant IP address. Network interface card (NIC) bonding involves combining the cards in parallel, in order to provide high availability, and provide redundancy should one of the links fail. The Smoothwall enables you to bind two or more NICs into a single bond. You must first create the “parent” bonded interface, before adding the bonded interfaces. If required, a bridge member interface can also be used as a bonded interface. 2. Click Add new interface. • Name — Configure a meaningful name for this bond. • Type — Select Bonding. • Ports — Select the relevant Smoothwall ports to be used as bonded interfaces. • Use as — Select whether this bonded interface is an External interface, Basic interface, or a Bridge member. Configure the default IP address for this bond. From the drop-down list, select the parent bridge interface. • MAC — The MAC address for this bonded interface is taken from the MAC address of the Port selected earlier. If MAC address spoofing is required, enter the new MAC address here. • Comment — Configure an optional comment for this bond. 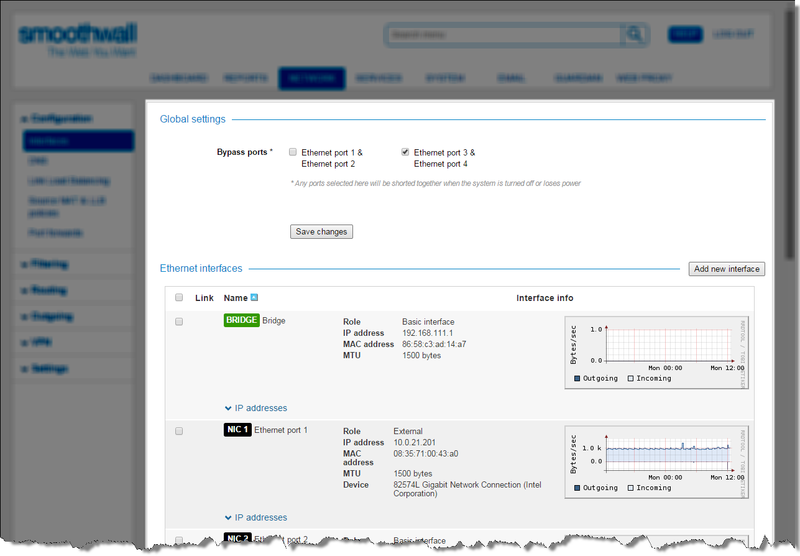 The Smoothwall adds a BOND interface to the Ethernet interfaces table, and changes the Role of the selected Port to Bond member. 1. Highlight the relevant interface, and click Edit. • Name — Configure a meaningful name for this bonded interface. • Use as — Select Bond member. • Bonding interface — From the drop-down list, select the parent bonded interface. • MTU — If required, you can set the Maximum Transmission Unit (MTU) size, in bytes, for packets using this bonded interface. • Comment — Configure an optional comment for this bonded interface. 2. From the Ethernet interfaces table, highlight the relevant bond, or bonded interface, and click Edit. 3. Edit the configuration as required. For a detailed description of each setting, see Configuring Bonded Interfaces. Note: You cannot delete a bond member, as this is a physical port on the appliance. To remove a bond member from a bond, you must change the interface’s Role to Basic. 2. From the Ethernet interfaces table, locate and highlight the relevant bond. 4. When prompted, confirm the deletion. You can create Virtual Local Area Networks (VLANs) to isolate resources, similar to creating network zones. In the Smoothwall, you can create VLAN interfaces, and associate multiple VLANs to a NIC of any role. Each VLAN is treated by the Smoothwall as an isolated network zone. The “parent” VLAN interface must exist before additional VLAN interfaces can be associated with it. If required, a bridge member interface can also be used as a VLAN interface. • Name — Configure a meaningful name for this VLAN. • Type — Select VLAN. • Parent interface — From the drop-down list, select the interface to bind this VLAN to. • VLAN tag — Enter the VLAN tag for this VLAN. This ensures that traffic from this VLAN is recognized and allowed through the interface. If there is no tag assigned to this VLAN, select Untagged. • Use as — Select whether this VLAN interface is an External interface, Basic interface, or a Bridge member. Configure the default IP address for this VLAN. • Comment — Configure an optional comment for this VLAN interface. 2. From the Ethernet interfaces table, highlight the relevant VLAN, and click Edit. 3. Edit the configuration as required. For a detailed description of each setting, see Using Virtual Local Area Networks . 2. From the Ethernet interfaces table, locate and highlight the relevant VLAN. It is possible to deploy the Smoothwall in-line using two or more NICs to create a transparent bridge on which web content can be filtered, and Deep Packet Inspection is possible. You must first create the “parent” bridge interface, before adding the bridge member interfaces. • Name — Configure a meaningful name for this bridge. • Type — Select Bridge. • Ports — Select the relevant Smoothwall ports to be used as bridge members. • Default IP address — This option is only available if the interface is Basic. Configure the default IP address for this bridge. • MAC — The MAC address for this bridge is taken from the MAC address of the Port selected earlier. • Comment — Configure an optional comment for this bridge. The Smoothwall adds a BRIDGE interface to the Ethernet interfaces table, and changes the Role of the selected Port to Bridge member. • Name — Configure a meaningful name for this bridge member. • Use as — Select Bridge member. • Bridge interface — From the drop-down list, select the parent bridging interface. • MTU — If required, you can set the Maximum Transmission Unit (MTU) size, in bytes, for packets using this bridge member. • Comment — Configure an optional comment for this bridge member. 2. From the Ethernet interfaces table, highlight the relevant bridge or bridge member, and click Edit. 3. Edit the configuration as required. For a detailed description of each setting, see Configuring Transparent Bridges. Note: You cannot delete a bridge member as this is a physical port on the appliance. To remove a bridge member from a bridge, you must change the interface’s Role to Basic. 2. From the Ethernet interfaces table, locate and highlight the relevant bridge. You can create a Point-to-Point Protocol over Ethernet (PPPoE) interface. • Name — Configure a meaningful name for the PPPoE interface. • Type — Select PPPoE. • Parent interface — From the drop-down list, select the interface to bind the PPPoE connection to. • Username — Enter the username supplied by your ISP for this connection. • Password — Enter the password supplied by your ISP for this connection. • Confirm — Re-enter the password. Do not copy and paste it from Password. • Bandwidth — Enter the minimum bandwidth used to load balance traffic from this connection across multiple gateways. Select whether the configured value is in kilobits per second (kbps), or in megabits per second (Mbps). • Connection monitoring — Connection monitoring is enabled by default. It is not recommended you disable this option otherwise the Smoothwall always assumes the gateway always has an internet connection. If required, enter the service name as specified by your ISP. If required, enter the concentrator name as specified by your ISP. • Comment — Configure an optional comment for this PPPoE interface. 2. From the Ethernet interfaces table, highlight the relevant PPPoE interface, and click Edit. 3. Edit the configuration as required. For a detailed description of each setting, see Using a Point-to-Point Protocol over Ethernet Interface . Note: You cannot delete a PPPoE interface, only the parent interface itself, as this is typically a port on the appliance. To remove a PPPoE interface, you must change the interface’s Role to Basic. 2. From the Ethernet interfaces table, locate and highlight the relevant PPPoE interface. You can assign IP address aliases to the PPPoE interface for management and operational purposes. 2. Click the Alias IP addresses link for the relevant PPPoE interface to display the Alias IP addresses table. • IP address — Enter the alias IP address for this PPPoE interface. • Status — New alias IP addresses are enabled by default. Clear the check box to create a disabled alias IP address. An additional button, Show comments, appears on the Alias IP addresses table if any comments are configured. Clicking this displays configured comments under the IP address. 2. From the Ethernet interfaces table, highlight the PPPoE interface, and click Alias IP addresses. 3. From the Alias IP addresses table, highlight the relevant IP address and click Edit. 4. Edit the configuration as required. For a detailed description of each setting, see Adding Alias IP Addresses. 3. From the Alias IP addresses table, locate and highlight the relevant IP address. Note: This feature is only available if you are using a Smoothwall appliance. For more information, contact your Smoothwall representative. You can choose to enable bypass ports on your Smoothwall appliance to ensure network access is still available, although unfiltered, when the appliance fails, for example, if the appliance was powered off. 2. From the Global settings panel, select the relevant port combination to short together. Note: The combination of ports available for bypassing are grouped according to function on the appliance, and cannot be changed.